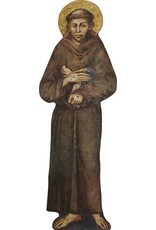 Take your picture with Saint Francis of Assisi! Our St. Francis life size standee is no cardboard cutout! Professionally mounted on art-quality gatorfoam, these standees are strong and durable enough to last a pontificate! This lifesize standee is 69" tall (5', 9") and is perfect for youth group, vacation bible school, church camps, etc.. The lifesize standee comes with a large cardboard easel for an easy and firm way of standing your figurine up.